SEO, short for search engine optimization, is a marketing tactic that makes it easier for potential patients to find your website when they search. Instead of pulling out a phone book and flipping through the yellow pages to find a healthcare provider, your patients are turning to Google or Bing to find doctors. What’s more, the majority of patients visiting to your website don’t come from paid ads, social media, or referrals. Believe it or not, 80% of internet users–that translates into 93 million Americans–search online for health information. Sixty-four percent of your potential patients online come from organic search results, meaning they typed a search term into Google, and your website appeared. 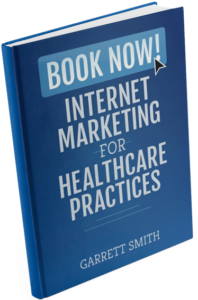 This makes SEO the number one driver of new patients for healthcare practices. SEO encompasses best practices and tactics that ensure your website is one of the first non-paid listings in the search engine results for health conditions and medical treatment searches related to your specialty. SEO is not an exact science because each search engine has its own complex algorithm and ranking system. Google, for example, has over 400 ranking factors that their algorithm takes into account before displaying search results to a patient. These algorithms are not only complex, but often updated. In fact Google has released 6 updates in 2016 alone, a trend that is likely to continue into 2017 and beyond. This means if your website doesn’t keep-up with the times and continue to comply with the best practices of the day, you could be missing out on patients by maintaining the status quo. Local SEO is a subset of search engine optimization (SEO) that helps ensure your practice appears highly for localized searches. Google and other search engines recognize that patients typically want a provider that close to home. As a result, they have began to change their search results pages to cater to these types of searches. Localized search results are characterized by the appearance of a map, and a listing of three to four businesses, underneath. Local SEO is still an emerging area of search marketing, so there is a tremendous opportunity to win additional patients, and stay ahead of your competitors today. This is especially true as Google and other search engines continue to deliver more and more localized search results. The difference between local SEO, and regular SEO, is that with local SEO, Google et al take in account a different set of ranking factors. In the past, appearing highly for patient searches required you to focus was on having a well optimized, modern, website. Now, Google and other search engines are using a searchers location, a providers proximity to the searcher, the quality of their Google My Business (GMB) profile, and even their ratings and reviews, to determine who ranks highly (or even appears on the map at all). This means that practices and providers need to pay attention to a number of off-page factors that they may not have addressed in the past. As you can see, this is why we put so much emphasis on Google My Business. It’s becoming the number one, most important, lever for improving your search visibility. Further, over time, local SEO will only become more important. Especially if you have more than one location or provider working at your practice. 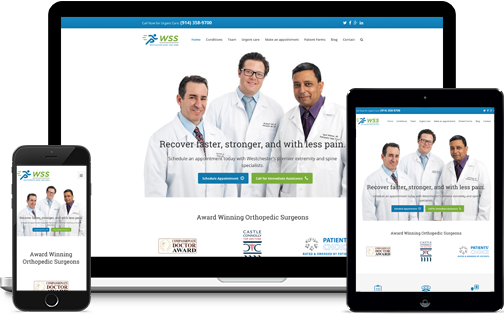 When a potential patient needs to find a doctor to treat their carpal tunnel syndrome, they could type “carpal tunnel treatment” or “wrist special near me” into a search engine such as Google. When this happens, within milliseconds, they’re presented with a search results page that has listings with hand and wrist specialists located near them. There’s a lot that goes into all of that, of course. Originally thought of and modeled based on a traditional card catalog, search engines came about due to the need to provide order to the thousands and now millions of websites that have come about on the Internet. Search engines use , what can be thought of as “exact match” thinking – they want to find search query results that are the closest match and the most relevant to that user’s search. To quickly search the billions of pages across the web, search engines use “web crawlers” or “spiders” to capture the content of website and store it in their index. When a potential patient searches for your specialty or a related condition, the search engine queries its database of websites, using its algorithm to display the relevant web pages for the search. Pages that score the highest according to the algorithm appear at the top of the search page, while less relevant pages appear at the bottom or on subsequent pages. When it comes to search engines, one thing is true – they are always changing. In fact, if you don’t use Google daily (like we do at InboundMD), you may be surprised at what your patients are seeing after they type in a search query. This is because Google, and other search engines such as Bing, are constantly changing not only how they rank websites, but also how they display information within their search results pages. That’s right, the days of basic search engine results pages (SERP) is over. Today SERPs are more complex, and varied, than ever before. One reason for this is that Google et al are constantly trying to do what’s best for their users (your patients). In this pursuit, Google is changing from a search engine, to an answer engine. As a result, SERPs are now structured to directly answer a searchers question, and provide information once only found after clicking on a result, without having to leave Google. Of course, another reason is that Google et al are businesses, and thus want to make as much money as possible. This is why there has been in increase in the number of Adwords spaces, especially on mobile, and other paid advertising options which has had some impact on the easy, and effectiveness of SEO campaigns. Now, just because SERPS are changing, and favoring more ads and structured answers, it does not mean SEO is any less important. There’s still plenty of opportunities for health and medical practices to acquire patients, and increase awareness through search. The first thing you’ll see on almost any Google SERP is a series of Google Adwords ads, their pay-per-click program. In order to show up in this area, your practice must pay to have an Adwords campaign targeting the appropriate geography and keyword searches. This Google Adwords section also often appears at the bottom of a SERPs page. The Knowledge Box replaced Google Adwords as the dominate presence on the right hand of the SERPs years ago. The Knowledge Box contains structured information related to the search query. The Knowledge Box most frequently appears for search queries relating to your professional name, and for search about your practice. It also sometimes shows for popular, high level searches, such as a health condition or injury. The information Google shows in the Knowledge Box is pulled primarily from your Google My Business profile. 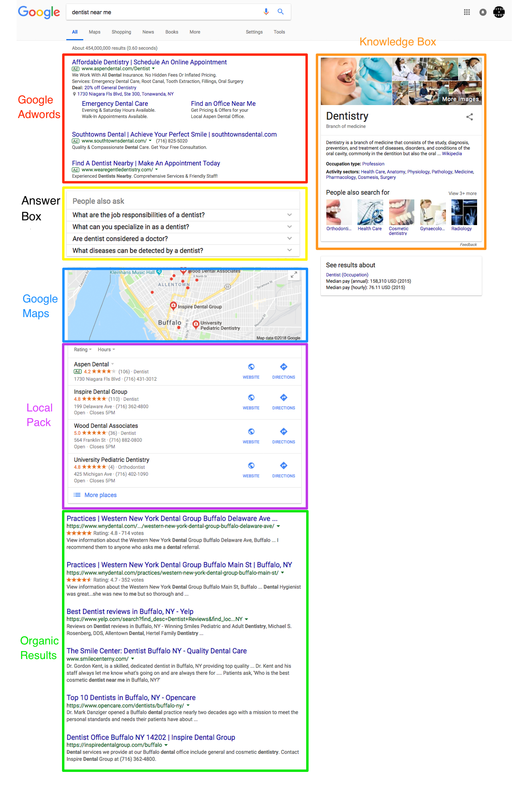 The Answer Box is a relatively new feature of SERPs, and the largest visible signal that Google is moving from a “search engine” to an “answer engine.” The Answer Box is frequently displayed, and showcases information Google scrapes from websites in their index into a Q&A style result. Interacting with the Answer Box triggers further questions and answers to be displayed. Oh, and your practice’s website can be optimized for the Answer Box. For most localized search queries, Google displays a Google Map with a listing of businesses in the area that are related to the search query. Since most health related searches are local in nature, this is a prominent feature since by millions of patients each day. The businesses that appear on the map (and the listings below) are based on the information found on their Google My Business profiles, another reason to make sure you’ve claimed and enhanced your profile. In conjunction with the Google Map, localized search queries also display a list of three to five businesses in the area (that appear above on the map). The Local Pack give users quick access to the most common information they’re looking for in a health care provider: Name, Address, Phone Number, Website, and of course, ratings and reviews. Like the Google Maps feature, the Local Pack is powered by Google My Business profiles. Lastly, organic search results appear. Once the dominate way SERPs were displayed, pure organic search results have been consistently deemphasized by Google and other over the years. Despite the decrease in focus (and screen share), organic search results remain the dominate source of traffic for most websites – including health care practices. A website that is optimized for search engines makes it easy for the search engine spiders to understand what your website is all about and for patients to find you. Good SEO requires focused efforts on three different elements: off-site SEO, on-site SEO, and technical SEO. Off-site SEO focuses on improving the search engine ranking factors that are not directly associated with your website. Search engines use factors such as links to practice’s website from other websites, listings of your practice on online directories, and reviews on profiles such as Google My Business to determine and validate that a website is reputable. In a search engines eyes, if a lot of popular websites link to your practice website, you have accurate practice directory listings, and a high volume of reviews, they will distinguish your practice as a place that a patient would want to find you and use your services. This makes third party links, listings (citations) and reviews the three most important factors for good off-site SEO. Engaging in marketing activities such as blogging and social media have a positive effective on your SEO as these efforts often result in others linking back to your website. Don’t forget to request clubs, community and professional associations you are a member or donate to, to list your practice’s website on their website – while these opportunities provide good offline exposure and community goodwill, these organizations have websites that can link to you too! Claiming and updating all of your online professionals profiles – beyond just Healthgrades and Yelp – ensures accurate information is listed on your profile and will provide you with additional links that will help your website rankings improve. In addition, consistently soliciting reviews from patients will signal to Google and other search engines that you’re popular with patients and should appear highly for searches. Remember that not all links are created equal – you can buy links from spammy sites, but search engines will actually lower your rankings or even blacklist your site if you have too many suspicious backlinks. Good off-site SEO takes time and patience as you build links from credible sources. On-site SEO focuses on improving aspects of your website, mainly the contents of your website and the individual pages. On-site SEO efforts start with keyword research, which determines what search phrases patients in your area are using to find practice’s like yours. Since search phrases and volumes vary by geography and specialty, this is a best practice that cannot be forgotten. If you don’t have pages targeting the search phrases patients are entering into Google, it’s highly likely you will not appear. In general, healthcare and medical websites should have a homepage that targets your core search phrase (I.E. “Dermatologist in Buffalo”), a bio page that targets the provider’s name (I.E. “Dr. Michael E. Mustache”) and a page for every condition treated, as well as, every treatment offered. Those pages should be written for the patient, but also have the search phrase (words that patients use to search for a healthcare provider) used throughout the page, so that search engines understand the page is about the search phrase topic. Search engines like Google also love authoritative content that explores topics at depth, so don’t be stingy with showing you’re a leader in your field. While you don’t want to bore your patients, you do want them to be fairly well educated, so try make each page on your website 750 – 1000 words in length. Another key to good on-site SEO is to consistently post fresh content. Whether that’s by updating existing pages with content (such as videos, infographics and images), or adding educational blog posts that speak to news, trends and other regionally or even seasonally relevant items. Finally, as Google and other search engines focus on showing patients search results that include practice websites located close to them, including your Name, Address and Phone number on every page ensures search engines know your local focus. Good on-site SEO, just like good off-site SEO also takes time. Unless you’re an accomplished writer and don’t mind cranking out a 1,000 words per day! Technical SEO includes all of the “hidden” search engine ranking elements and most often requires knowledge of website development to ensure adherence to best-practice and correct any issues. Technical SEO efforts ensures your website is fast-loading, coded using best practices and is easy for search engine spiders to scan and include it in its search index. Making it easy for patients and search engine spiders to use your website is a big key to SEO success. As devices, internet speeds, and patients get faster, search engines need your website to keep up. Patients attentions spans are shorter than ever and they have no time to wait for a slow loading website – or one that’s not built to look great on their mobile phone. That means if you haven’t updated or rebuilt your website in the past couple of years, your competitors who have are likely getting a boost in their rankings from Google. Using tools like Google Webmaster can help you diagnose technical errors and create a site index, so you can ensure your website has the best chances of being seen. There are also a number of other tools that you can use to see how fast your website loads and what can be done to make it work faster. You can always just do it yourself, as well. Put yourself in your patient’s shoes – pull out your mobile, Google your specialty (or your practice) and see if you like what you see. Did you show up in the search results? How long did it take for your website to load? Is your website mobile-friendly or responsive? If you’re not sure or not happy with what you find you probably have a technical SEO issue that needs correcting. Search engine optimization is a continually changing field. What works today may not work tomorrow; Google and Bing regularly change their search algorithms. Each search engine has many factors that affect search rankings (Google has at least 200), but each is weighted differently, and those weights can (and do), change over time. To date, a high volume of quality backlinks to your website and content optimized for what your targeted patients are searching have been the most important SEO ranking factors. Let’s take a look at each of these areas, including how online reviews are playing an increasingly larger role in SEO. According to a recent study, the #1 most important SEO ranking factor is now your practice’s reviews. Yes, this means your online reputation has even more of an affect on how successful your practice can be. Google is now weighing your overall ratings, the number of reviews, and the number of reviews that mention specific keywords. So, while assembling the search results page, Google’s algorithm will scan the stats on your business and compare it to a competitor’s profile. Now, more than ever, it’s important to set systems in place that solicit reviews from your patients. Routing them to a specific profile is the best way to ensure that they leave a review where it counts the most. Giving them direct instruction to leave a review on your Google profile, for example, is also a great way to boost the likelihood of that review being left in the first place. As a way of verifying your website’s credibility, search engines like to see a large number of unique domains linking to your website that they already deem authoritative and trustworthy. The more specific the website is to your specialty, trustworthy and popular (say, The Wall Street Journal vs. a personal blog), the more valuable the link. The more valuable links you get, the more of a positive effect it will have on your search engine rankings. In addition to the number of unique domains linking to your website, you also want a high quantity of backlinks to your website. Google ranks websites according to the quality of their links as well as the quantity of links. If you’re in a small town or just getting started with your SEO efforts, focus on creating good content, sharing that content, and asking friendlies to share and link to your content. Over the last few years, Google has placed increasing emphasis on local search results, as over 85% of Google’s daily search traffic comes from local searches. This trend has lead Google to develop the local 3-pack search, a map and list of three providers, located below paid advertisements and above the traditional organic search results. Today, when you conduct a search from your desktop or mobile for a healthcare provider, you are likely to see these local 3-pack search results, making them an important part of successful SEO efforts for practices. Unlike organic search results which take into account ranking factors for your website, appearing on the map and in one of top three slots requires a Google My Business profile and efforts to enhance its relevance to patient searches. You should first look to see if you have claimed and enhanced your Google My Business profile, then move on to enhancing the profile with proper business category, description, hours and photos. Once completed, encouraging patients to leave reviews after their visit will help you make the most of your efforts. Increasing your link volume comes with time and consistent efforts! In the early days of SEO, experts advised keyword stuffing a page – literally using the search phrase over and over again on the page would be enough to rank highly. Back then, search algorithms weren’t as advanced as they are today, so as long as your content had plenty of keywords, quality didn’t matter. Today, algorithms have gotten smarter and while they still look to the Page Title to determine what the page is all about, they now rate you for the quality of your content. This means search engines are tracking things such as page length, external links (links to other sites), how long a patient stay on the page and whether patient goes to other pages on the site or leaves after just one page view. The best way to ensure you’ve got high quality content that delights patients is to write for your audience rather than a search engine. Using keyword research in addition to a relevant page ensures Google can match the content to a search query from the start, but to be successful you must make sure your content is well-written and engaging for patients. Optimizing a website takes time and patience. New traffic won’t necessarily flow in overnight, even if you make the right changes now. You could guess what keywords your patients might be searching for, or you could use a tool like Google Keyword Planner to find what they are actually searching for. For starters, check out the five surprising search terms you should be targeting. When you claim your website on Google Webmaster Central, you can submit a sitemap and a robots file so Google can easily crawl and search your site. Webmaster also checks for technical errors like site speed and provides instructions on how to fix them. Most of your patients will likely come from your local region. To attract those patients, it’s important to claim and optimize your Google My Business profile. Every condition you treat and every treatment you offer should have a dedicated page on your website. Each page should contain high quality content with about 650 to 1000 words that your patients can benefit from. Instead of buying spammy links, ask your network to link back to your site. Good backlinks to have are ones from any medical associations you’re a part of, any health networks you work with, and any partners you have. Search engines like to see fresh content on your website. Create a strategy to continually generate new content. And, as always, share that content on your social media pages.